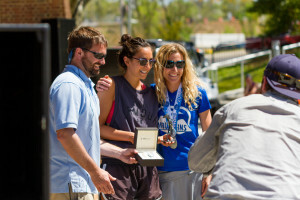 Finish Festival Times: 8:30 a.m.-3 p.m.
What to Expect: Food trucks, local craft beers (one free beer per runner), artists & vendors, free live music, free massages and food tent for runners, awards ceremonies, swag from sponsors, and lots of cheering! Plus its a two minute walk right into the heart of downtown Roanoke! Music and running just seem to go well together, which is why we’ve partnered with the Down by Downtown Music Festival to bring our runners live music all weekend long. 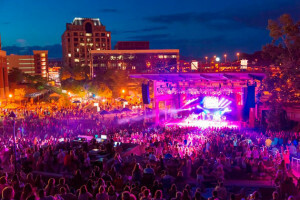 This multi-day festival features live performances at 14 venues throughout downtown Roanoke, and culminates with a Saturday headliner at Elmwood Amphitheater following the marathon. Racers get two tickets at a significantly reduced rate (learn how). In addition to the FREE live music throughout race day at the finish line, there’s also a FREE concert on Friday night at Elmwood Amphitheater. After the race expo take a short walk over to check out the finish line and free show. Click here for more details on the bands, show times, and tickets. Anthem Star 10K Ceremony: 10 a.m. 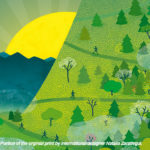 Foot Levelers Full Marathon, Double and Relay Ceremonies: 2 p.m.
Click here for more details about our awards’ ceremonies. There will be free live music acts in between each ceremony to entertain spectators and runners waiting for their prizes. There will be a large TV monitors where results will be posted in real time. Thanks to Fleet Feet Sports Roanoke you will have all your recovery needs met right as you cross the finish line. This isn’t your ordinary finish line either, you will be pampered with complimentary massages from local therapists, chiropractic adjustments, ice baths, free access to Addaday Therapy Sticks & foam rollers, and 15-minute recovery yoga sessions. There will even a recovery expo where your trusted friends at Fleet Feet can offer you advice on nutrition, compression, footwear, and more. 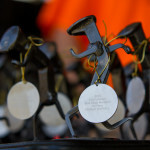 For all ages categories, in each race the top three finishers will receive a hand welded “runner’s spike” built by a local welding school and powder coated right here in Roanoke, VA. Since they are all hand made no two are alike, just like our runners! These trophies are a beautiful addition to any mantel, and a great conversation starter. The “runner’s spike” idea is built around Roanoke’s heritage as a railroad town. The railroad still runs right through the heart of the city and now you are able to take a passenger train from downtown Roanoke to major cities such as DC, Boston, and NYC. Each trophy also has a small medallion indicating your age bracket, year, the race in which you competed and place. 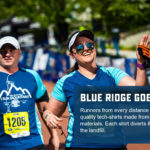 Everyone knows that half the reason you run these crazy races is for the shirt, swag and finisher’s medal and the Foot Levelers Blue Ridge Marathon does not disappoint. Every finisher receives a unique medal specific to their race distance.